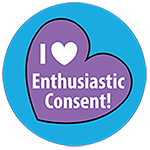 1.5″ Button with “I <3 Enthusiastic Consent!” written in white placed inside of purple heart on an aqua button. The inner rim says “Communicate. Negotiate. Participate.” The back has a standard steel pin closure.